Greetings! Many dissertation and thesis writers LOVE Dr. Single’s System for Academic Writing. I’m one such thesis writer. It is probably the most enlightening thing I’ve ever encountered about academic writing, aside from George Gopen’s exceedingly eye-opening, very awesome work, “The Sense of Structure: Writing from the Reader’s Perspective.” I looked up the other day and realized that my digital workflow FLOWS very fluidly now (despite being both digital and physical and being comprised of multiple programs). And it employs Dr. Single’s System beautifully (well, in my humble opinion–smile). The digital “supporting actors” of the workflow are: LiquidPlanner, ProWritingAid, and your text editor of choice (I use MS Word). NOTE: The Mac version of Scrivener is more robust than the Windows version of Scrivener that I use. Thus, some of the steps (such as the Read-Aloud editing step) can be done within Scrivener Mac instead of Adobe. 1) WRITING MANAGEMENT (TIME, TASK, & PROJECT MANAGEMENT of the WRITING) Create a reverse calendar using Liquid Planner. (Here’s my video review of LiquidPlanner). Always start the timer in LiquidPlanner when starting tasks. This enables you to discover/learn how long things really, actually take you so that your planning gets more accurate and real as time goes on. Note: I applied for free, educational use of LiquidPlanner. Store, organize, and tag PDFs in Mendeley. It is smart to have tags such as “has been physically printed already” so that I know to look in my file cabinet for a physical copy instead of forgetting this and printing and printing again and again . . .
Read and annotate PDFs in Mendeley (or Adobe if using the PRO version). To keep a PDF cleaner than not, annotate to the heart’s content in Mendeley, but in Adobe Pro add only “bubble sticky notes” and NO HIGHLIGHTING. Transfer (i.e. copy and paste) annotations from Mendeley into Citavi as citeable notes (that are THEN copy-able and paste-able to Word, Scrivener with citation attached). Citavi holds images and tables, too. Remember: Citavi will build my bibliography based on what only I cite. Easily copy and paste references, notes, and quotes between Citavi files. IMPORTANT: Either maintain a Citavi file that mirrors the Scrivener file’s outline; keep separate Citavi files named by topic, book, article, etc. ; or some combination of the two. Name Citavi files carefully, though, so that you can find quotes and notes again. Again, easily copy and paste references, notes, and quotes between Citavi files. 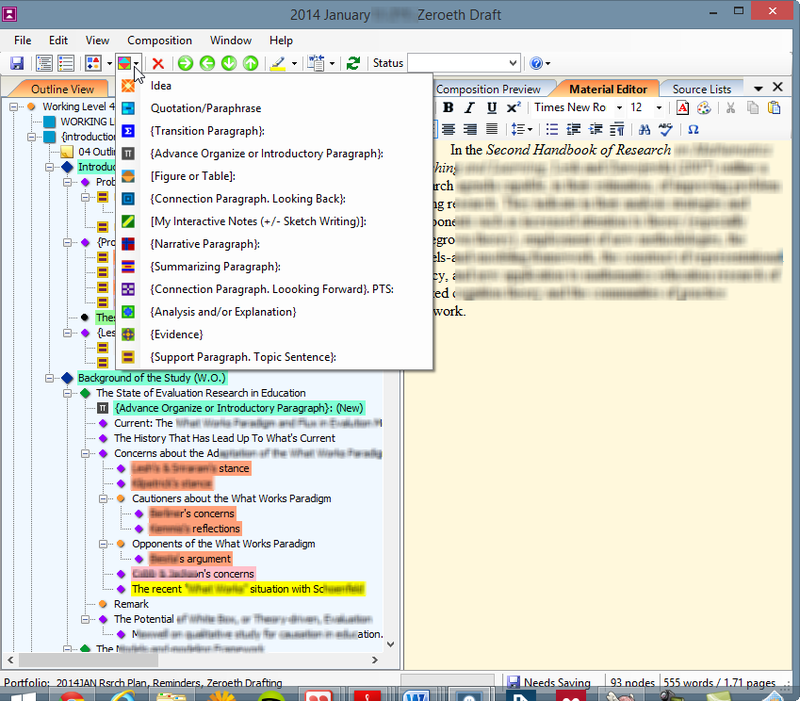 Create a thesis/dissertation outline in Scrivener (see item 7 below about XMind for outlining). Save this outline-containing Scrivener file as a template. Then open/create a “DRAFTING” version of this file, and open/create a “JUST-USE-ME-FOR-COLLECTING-DONE-PRINTABLES” version of this file. VERY IMPORTANT: There should be one, dedicated Scrivener file that you can open and simply know that the only thing within is POLISHED DONE pieces. DO. NOT. DRAFT. HERE. This file just exists to RECEIVE polished pieces. You paste completed sections into this file. This is the file you will compile and export at the end. To reiterate: It is NOT where you draft/compose. Warning TO-DO: Do freewriting, drafting, and “storage of doneness” separately—meaning in completely separate Scrivener files. Don’t start mixing these. It gets messy FAST otherwise. Just don’t do it. Thought: In addition to the 2 versions advised above, some people may also want to create a “FREEWRITING” version of this file. I don’t! That’s too much for me! INSTEAD, Scrivener allows you to save freewrites by name within the global Scratch Pad of Scrivener. That’s good enough and less complicated for me! I prefer to SKIP having a whole, extra Scrivener file to manage. SCRIVENER’S COMMENTS FEATURE IS A STAR IN THIS WORKFLOW: In the “DRAFTING” version of the Scrivener file, add the “comments button” to the toolbar. To start drafting/composing: In one of the text files, type “P1” and a comment for it: In the comment, plan the point to make in paragraph 1 and note the citations needed—e.g. Smith (1995) p. 2; Maxwell (2005); Crotty image; Pawson (2005). If you accidentally delete a needed comment, push the “undo” button in Scrivener (add the undo/redo buttons to the toolbar, too!). Draft the paragraph. Stop when it’s g’nuff (i.e. “good enough”). THE HUGE KEY TO ALL OF THIS: Remember that HOVERING OVER A COMMENT ICON WILL DISPLAY THE FULL COMMENT. Display the paragraph-planning comment so you can mull it, then start drafting the paragraph, then mull it some more, then continue drafting the paragraph, and so on. DON’T SHOOT YOURSELF IN THE FOOT: Take 3MonthThesis’s advice here: DON’T BEGIN A NEW PARAGRAPH WHILE LEAVING THE PREVIOUS ONE NEEDING A WHOLE BUNCH OF WORK: THIS WILL RESULT IN AN OVERWHELMING SMATTERING OF UNFINISHED THOUGHTS. TAKE THE TIME TO HONE THE PARAGRAPH WELL ENOUGH. THEN MOVE TO THE NEXT PARAGRAPH. WHAT PARAGRAPH IS NEXT NEEDED DEPENDS ON THE ONE BEFORE IT, ANYWAY. USE SCRIVENER’S SCRATCH PAD TO FREEWRITE: If you need to just freeflow write without honing paragraphs, do this in a FREEWRITING version of the file or better yet via Scrivener’s Scratch Pad functionality. USE SCRIVENER’S FULL EDITOR FOR DISTRACTION-FREE WRITING: IN THE VERY BUSY SCRIVENER PROGRAM: Feel free to draft in the distraction-free FULL EDITOR. The hover-over-the-comments-icon thing still works in the full editor view. Plan the next point that needs making. Feel free to EITHER plan all points before drafting OR plan-one-paragraph-and-then-draft-it, plan-another-paragraph-and-then-draft-it, and so on until there are no more points you need to make for that section. 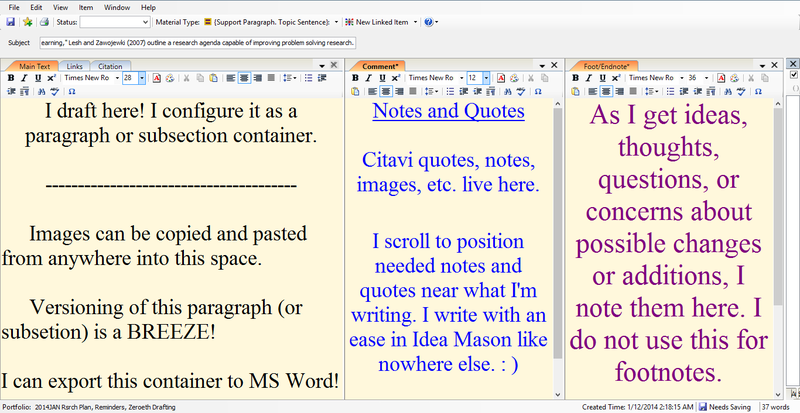 CITAVI IS A STAR IN THIS WORKFLOW: While drafting paragraphs, copy and paste needed quotes/notes from Citavi. Remember: References and citations will be automatically taken care of once you employ this simple set of steps: see http://service.citavi.com/KB/a357/using-citavi-with-scrivener.aspx. Export/save the current section as a PDF. Print a physical copy and have pencil in hand. Have Adobe read your work aloud to you. On your physical printout, with that pencil you have just ready and waiting, jot “fixes” and editing notes as you listen. Paste a subsection of your writing into ProWriting Aid’s online editor at http://prowritingaid.com/Free-Editing-Software.aspx#.UUhEohzU-n8. Click the “Analyze” button and mindfully use the results at your discretion. Copy and paste–or import–COMPLETELY DONE SECTIONS to the “JUST-USE-ME-FOR-COLLECTING-DONE-PRINTABLES” Scrivener file. As often as desired, compile the “JUST-USE-ME-FOR-COLLECTING-DONE-PRINTABLES” Scrivener file, and export it to MS Word. 7) HONORABLE MENTION: XMind for Outlinining and Creating Audio Notes I’d be remiss if I didn’t mention XMind for brainstorming in the form of mind mapping. This is usually how I discover/create/hone my outlines. Good writing of very long works hinges on the outline: A long work’s outline needs to be authentic–the one you REALLY want to write from, not just the product of an exercise just so you can claim have an outline–and it needs to be quite thoughtful. XMind can get your outline there! And it’s FUN: You can attach audio notes to every mind map node in XMind; you can dive down into nodes to get to a zoomed-in view; and you can (re)emerge up from inside a node to get to a higher-level view. As I stated at the start, though this method READS long, that’s because I’ve added a lot of extra details. In actuality, it’s relatively quick and flows. More importantly, it has you producing drafts while it keeps up with your citations and references. I’m elated and recently pretty easily produced 8 pages of “done” writing using this workflow. As always, happy writing!!! April 16, 2014 Update: Please view this workflow PDF, check recent blog posts, and visit the Tools pages in this blog’s menu to see updates to my approach as I make them. April 15, 2014 Update: Idea Mason (mentioned below) does not like Windows 8.1+ on my laptop. I have switched to drafting in OneNote. I still use Scrivener simply to hold polished sections and not for drafting. I switched back from Qiqqa to Mendeley. (I know, I know.) More people use Mendeley and it was easier to share using Mendeley. I have replaced Mendeley with Qiqqa (for links to the Qiqqa website and Qiqqa’s own videos, please see the PDF linked above). I do my mind mapping in Docear. It’s free and allows you to easily toggle your mind map from a brainstorm branching tree to a hierarchical outline and back, which is ridiculously helpful. I just wouldn’t have been able to imagine how much it helps to create concept maps from your notes and early outlines and then toggle a concept map into a sequential, hierarchical outline to see how it would read as a paper. Wow! Wish I’d been doing this earlier. Detail: To design the paper, I turn a tentative level 4 outline — which I’d built emergently in Citavi as I read, quote-excerpted, and took notes in Citavi — into a story tree as explained by Dr. Carlis here and as pictured here in this snapshot from my Idea Mason file. Designing a story tree leads me to doing good zeroeth drafting, peacefully and fast in Idea Mason (see point four below on zeroeth drafting). WARNING: I don’t use Idea Mason’s citation functionality. I find it quirky. Most other Idea Mason users are fine with it. However, I would think twice about Idea Mason. Use it perhaps if “zeroeth drafting” for you is challenging in MS Word or Scrivener, you have a citation work around, or you don’t mind doing citations later in the first draft. As the video I shared above shows, I think so much better and more fluidly in Idea Mason toward quicker production of writing, SO much more easily than anywhere else such that I just won’t leave Idea Mason out of my workflow. But if you flow in Scrivener, consider skipping Idea Mason. I have compared drafting in Idea Mason with doing it elsewhere, and writing slows substantially for me in other writing environments in comparison. I hope to make a video to explain my complete note-taking, then mind mapping (as needed), then designing, then drafting, then honing process via my Citavi-to-Docear-to-Idea Mason-to-Ms Word workflow, hopefully once I submit my thesis. Detail: Subsection by subsection in Idea Mason I sketch-write and create a zeroeth draft. I make GOOD use of Idea Mason’s versioning feature so that I hesitate not at all to experiment with making major changes to paragraphs and subsections. This gets better ideas captured down on the screen in black and white faster, and that makes my writing overall go much faster. Much. Detail: In Idea Mason I create and the configure my “materials” (writing containers) such that I have paragraph containers of different types. Here’s a picture. I build my paper with all “support paragraph” types at first. If I feel it helps, I’ll indicate a paragraph type as a transition paragraph type or a summary paragraph type or what have you later during revising. Also, I configure the layout of my paragraph and section containers such that I can paste the zeroeth draft version to the right of a blank space for writing a honed draft of it. They sit side by side, then, and I hone writing pieces in this way. This picture of an Idea Mason paragraph or subsection container that I created and then configured shows how that’s possible within Idea Mason. I export my Idea Mason draft to MS Word and use the amazing Citavi Word Add-In to do citation work. Citavi auto-generates the bibliography from there. The other parts of my workflow remain the same as explained below in the original post except . . . I only use Scrivener as a repository for my honed, final, to-be-compiled-and-printed drafts now. I know!!!!! This is because I am able to do the designing and thinking and chunking in Idea Mason that I only WISH I could do in Scrivener. As you can see in the Idea Mason video I shared above, that makes sense, though: I literally build my paper with paragraph containers (subsection by subsection) in Idea Mason and toggle very fluidly back and forth between the outline, the draft as a whole, and paragraph containers back to the outline, the draft as a whole . . . 🙂 Since I have Scrivener and Scrivener’s exports to MS Word require little formatting, I might as well use Scrivener to collect my completed sections and chapters. What I’ve learned from all of this work on my workflow is that it’s paradoxical: Simplicity is not about the number of tools in your workflow. It’s about having the right tool for the each job, only doing the jobs needed, and ensuring that each job’s tools yield a product with which the next tool can work. Oh, and, the other thing I’ve learned: Only make changes to your workflow if you really need to. And you can sense when you really need to :). When a tool OR your methodology is stalling you such that it hurts and does not help or help enough, you probably need to adjust your workflow. As I mentioned, once I’ve submitted my thesis, I hope to be able to create a blog post and a series of 4-minute videos to demonstrate the tweaks I’ve described here. To get a sense in the meanwhile, you might view the Idea Mason series of videos, this Citavi video, and the aforementioned PDF. As ever, happy writing, and take care! This entry was posted in academic workflow, Citavi, effectivness, efficiency, goals, momentum, note taking, productivity, PROJECT MANAGEMENT, proofreading technique, Quick Writing Process (QWP), Scrivener, software product, task management, time management, writing by Z. Sanders. Bookmark the permalink. What I like about Saul’s method is the stable storage for my hundreds of pdf articles and the system is interchangeable with tools like Docear and Citavi. I look forward to incorporating parts of your workflow, exploring Citavi, and using Scrivener, LiquidPlanner, and PWA… Thank you Z for this awesome post! A little late to this article, but love the idea of using Citavi. Thanks for sharing. I will check it out. I like that it builds the reference lists automatically. So that’s incredibly awesome. 1) why don’t you use Scrivener for drafting? in my experience that is the main purpose of the software. for depositing ready-made pieces, any other program would do, even MS Word. 2) why do you annotate your PDFs in Mendley instead of Citavi? or maybe this is a newer Citavi feature? I just don’t see the point in maintaining two separate databases of PDFs. Looking forward to hearing your take on these things! i had the same question for #2. i believe the answer is we should use citavi for annotation! Hi, thanks for this detailed post, I’m hoping it will get me through my dissertation in a survivable manner! A question regarding books and non-pdf material: how do these come into the workflow? 1. is organizing book references, 2. organizing secondary data from interviews/posts online or elsewhere. Great post! So useful! Thank you for pointing to Liquidplanner, their best case worst case scenario feature seems to be exactly what I am looking for. I have just one question: how do you apply for a free educational purpose account? I can’t find that option anywhere. Actually, I found it. Thanks! I’ve been exploring for a little for any high quality articles or blog posts on this kind of area . This is wonderful, thank you! I looked at the Liquid Planner website and couldn’t find a way to apply for free educational use. How were you able to do that? Check the right bottom of their site and you will find it! Hi, Jonathan. Thank you for the question. I don’t have a generic dissertation template, but it wouldn’t take you long to find one online and represent it in Scrivener. Love this article,aforementioned points mentioned very informative for many students. I think I’m a little bit in love with you, Mickey. Thank you so much for writing this! awesome article! love your post!